ANGELO VACCO tends the bar where everyone knows your name. “Hey, Ryan, you want an Asahi?” bartender Katie asks as a patron walks through Little Bar’s front door. In fact, this is about the fourth person Katie has called out by name since I sat down at the polished wooden bar 20 minutes ago. And by the looks of it, she knows the other 20 patrons by name as well. “I’ve never been here when I don’t see someone I know,” another regular, Adrienne, chimes in. When Angelo Vacco opened Little Bar on La Brea, south of Wilshire, 10 years ago, the area was a desolate landscape of tired businesses and empty lots. 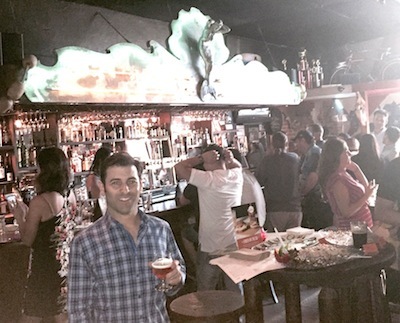 Vacco opened the bar at 757 S. La Brea Ave. in 2005. The neighborhood response was immediate. “People walked in the door and said, ‘thank you!’” smiles Vacco. The bar only served beer and wine in the beginning—and no food—but the neighborhood didn’t seem to mind. Three years ago, Vacco secured the full liquor license, so patrons can now enjoy 15 beers on draft in addition to a fully loaded bar. But there’s still no kitchen. Owning a bar was never Vacco’s original dream. He hails from New Haven, Conn., where he bartended before coming to Los Angeles to pursue acting (still ongoing and successfully, by the way). His bartending work caught the eye of Madonna—yes, that Madonna—and he ended up serving as her private bartender for house parties, shows and special events. “I had to show up with all of the equipment, the set-up and the product. It felt like I was running my own business, so it gave me the idea to open a bar,” says Vacco. Friends thought he was crazy, but he went ahead and took out loans from friends, banks, savings and credit cards. Creating the right atmosphere was the first challenge. Vacco envisioned an old Irish alehouse like the famous McSorley’s in New York, with oil on the bar, sawdust on the floor and the smell of kerosene. Those interesting pieces include a rocket ship, wine barrels, pressed-tin wall tiles, and a mermaid. In addition to being a traditional neighborhood watering hole, the Little Bar is also known for its popular Saturday Night Trivia and Monday Karaoke night. Vacco is currently serving his second year as board member and business representative of the MidCity West Neighborhood Council, and he’s happy to be a part of the rapidly changing community. “By being a small business owner, I’m naturally involved and I want to serve the people in this area,” says Vacco. The area has changed a lot since the bar opened in 2005. With the addition of 480 units in the Wilshire La Brea apartment complex across the street, the coming Wilshire subway, new restaurants, exercise venues, stores and dance studios, the future continues to look bright for this local favorite. Yep. Where everybody knows your name—now even mine. Cheers!